You've got to find what you love. The only way to do great work is to → love what you do. If you haven't found it yet, keep looking. Don't settle. As with all matters of the heart, you'll know when you find it. Here’s to the → crazy ones, the misfits, the rebels, the troublemakers, the round pegs in the square holes… the ones who see things differently – they’re not fond of rules… You can quote them, disagree with them, glorify or vilify them, but the only thing you can’t do is ignore them because they change things… they push the human race forward, and while some may see them as the crazy ones, we see genius, because the ones who are crazy enough to think that they can change the world, are the ones who do. You can’t connect the dots looking forward; you can only connect them looking backwards. So you have to trust that the dots will somehow connect in your future. You have to trust in something – your gut, destiny, → life, karma, whatever. This approach has never let me down, and it has made all the difference in my life. That's been one of my mantras ‒ focus and simplicity. Simple can be harder than complex: You have to work hard to get your → thinking clean to make it simple. But it's worth it in the end because once you get there, you can move mountains. → customer who’s voting thumbs up or thumbs down. That’s who we think about. And we think that our job is to take responsibility for the complete user experience. And if it’s not up to par, it’s our fault, plain and simply. People don’t want to just buy personal computers anymore. They want to know what they can do with them, and we’re going to show people exactly that. → Innovation distinguishes between a → leader and a follower. We’re gambling on our → vision, and we’d rather do that than make ‘me-too’ products. → Creativity is just connecting things. Innovation is the ability to see → change as an opportunity – not a threat. → Innovation has nothing to do with how many R&D dollars you have. When Apple came up with the Mac, IBM was spending at least 100 times more on R&D. It's not about money. It's about the people you have, how you're led, and how much you get it. To turn really interesting ideas and fledgling technologies into a company that can continue to → innovate for years, it requires → a lot of disciplines. My experience has been that creating a compelling new technology is so much harder than you think it will be that you're almost dead when you get to the other shore. Sometimes when you innovate, you make → mistakes. It is best to admit them quickly, and get on with improving your other innovations. Some people say you have to be a little crazy to buy a Mac. Well, in that craziness we see genius and that’s who we make tools for. I’m as proud of what we don’t do as I am of what we do... Our leadership comes from saying 'no' to 1,000 things to make sure we don’t get on the wrong track or try to do too much....it’s only by saying 'no' that you can concentrate on the things that are really important. Part of what made the Macintosh great was that the people working on it were musicians, and poets, and artists, and zoologists, and historians who also happened to be the best computer scientists in the world. The only thing that works is → management by values. Find people who are competent and really bright, but more importantly, people who care exactly about the same things you care about. It’s not about pop → culture, and it’s not about fooling people, and it’s not about convincing people that they want something they don’t. We figure out what we want. And I think we’re pretty good at having the right discipline to think through whether a lot of other people are going to want it, too... We just want to make great products. When I hire somebody really → senior, competence is the ante. They have to be really smart. But the real issue for me is, Are they going to fall in love with Apple? Because if they fall in love with Apple, everything else will take care of itself. They’ll want to do what’s best for Apple, not what’s best for them, what’s best for Steve, or anybody else. Be a yardstick of → quality. Some people aren't used to an environment where excellence is expected. 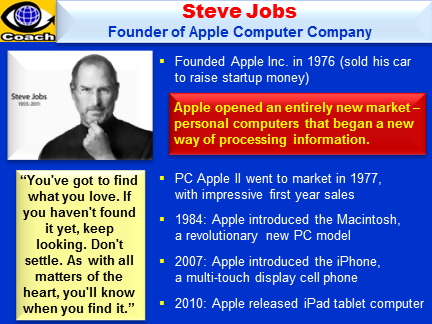 Steve Jobs, founder of Apple Computer Corporation, was one of the most successful → entrepreneurs. His success story is legendary. His unwed mother decided to put him for adoption immediately after Steve was born because he was "an unexpected baby". He went to college but decided to drop out because it was too expensive. Recalling his time there Steve Jobs said, "I didn’t have a dorm room, so I slept on the floor in friends’ rooms, I returned coke bottles for the 5¢ deposits to buy food with, and I would walk the 7 miles across town every Sunday night to get one good meal a week at the Hare Krishna temple." At 20, Steve Jobs and Steve Wozniak started a company in a garage on April 1, 1976 after Steve saw a computer Wozniak designed for himself. Jobs named their company – Apple in memory of a happy summer he had spent as an orchard worker in Oregon. The company's second product called Apple II became such a hit that it is credited to be the best selling computer in the 1970s and early 1980s. By 1982 however, his company sales sagged in the face of competition from IBM’s new PC. Introduced in 1984, by 1986 the Mac was a huge success. After 10 years, starting from 2 kids working in a garage, Apple computer had grown into a $2 billion dollar company with over 4000 employees. A tragedy? Not at all! "It turned out that getting fired from Apple was the best thing that could have ever happened to me. The heaviness of being successful was replaced by the lightness of being a beginner again, less sure about everything. It freed me to enter one of the most creative periods of my life," said Steve Jobs later on. Steve Jobs is also a Former Chairman and CEO of Pixar Animation Studios, which is popular for its production of animated films such as The Incredibles and Toy Story. The firm was bought by Walt Disney Studios for $7.4 billion in stock, making Jobs the biggest individual shareholder at Disney.